Most perennial pastures based on summer dormant cultivars of perennial ryegrass or phalaris with sub-clover, have limited ability to utilize rainfall in late spring or over summer. In these pasture systems, quantity of feed is usually the main limitation for stock over winter, whilst feed quality is usually the limitation over summer if animals are required to grow or produce. Residual dry feed is relied on to carry stock through summer and autumn. The carry over dry feed from good quality pastures is usually sufficient to maintain stock or support slow weight loss. In most years there is insufficient energy and protein to finish lambs or grow out weaners (sheep or cattle), which can result in high supplementary feed costs or quitting stock as stores. Including a proportion of summer responsive pastures in a whole farm system, can provide an opportunity to utilize late spring and summer rain to produce high quality feed. Some summer active pasture options may come at a cost to winter production, may not persist as well as traditional winter active pastures and may require more skilled management to fully utilize the different pastures. The occurrence of summer rainfall varies between locations and between years. Local experience and climate history can provide a guide to the likelihood and frequency that it may occur. The extra costs and potential rewards for including summer active pastures in a winter dominant environment, need to be assessed for every situation. This page outlines some of the options available, pros and cons and provides links to producer experiences in incorporating different summer active species into their systems. Lambing and calving times as well as livestock production systems differ in their response to quality feed over summer. For example, lambing early in autumn or winter and selling lambs by the time feed has dried off, will not provide an opportunity to utilize quality feed over summer. Similarly autumn born lambs or calves that are retained will already have passed their peak growth period (in most years) by summer. Providing quality feed over summer offers most benefits to systems that have young stock, such as late winter or spring drop lambs or calves that require high nutrition to support growth over late spring and summer. Green feed over summer also provides opportunities for flushing ewes and improving condition of autumn calving cows, but sowing a special purpose pasture just for this is unlikely to be profitable if there is a trade off in overall farm stocking rate or animal turn off. If considering summer active perennials to finish stock, compare all options and potential returns such as feeding supplements or quitting stock early as stores (or opportunity lot feeding). Deep rooted summer active perennials, such as lucerne and chicory, can respond to rainfall year round and access moisture from deeper in the soil profile compared to a ryegrass or phalaris dominant pasture. Depending on rainfall they can provide a high energy and protein forage in late spring, summer and autumn, providing production and environmental benefits such as reduced recharge and risk of salinity. Table 1 shows the range in pasture growth rates, production and feed quality (as digestibility) for lucerne and chicory at the Hamilton Proof Site between 2007-2010 in summer and autumn. Including these species may reduce the need to feed high energy and/or protein supplements which may or may not be cost effective. For finishing lambs or growing out Merino weaners, a summer active perennial pasture reduces the risk of shy feeders and getting stock onto grain (acidosis). Figures in brackets are the average growth rates over ( 2007- 2010) for the season. Cattle grazing lucerne at the Hamilton Proof Site. Lucerne provided valuable summer feed. Lucerne is sensitive to acidic soils particularly those that have a high risk of aluminium toxicity at depth and likes a well-drained soil. These characteristics exclude its establishment in some soil types. Breeding has resulted in new cultivars of lucerne that are not only more winter active but also more persistent under less formal rotational grazing. This means that summer growth may not come at the expense of winter production. Other species sown with lucerne, or that volunteer between lucerne plants, can also contribute significantly to feed availability. 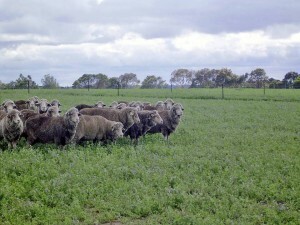 Lambs growth rates on lucerne are variable, and often below their theoretical potential. Whilst lamb growth rates were not measured on the EverGraze project, the literature suggests they can range from 60 – 270g/hd/day on dryland lucerne with feed quality ranging from 8 – 12 MJ ME/kgDM and 16-30% crude protein over summer and autumn. Quality and quantity is heavily dependent on the time since the last rainfall event and the stocking rate. At Hamilton Proof Site, a winter active (SARDI 7) was included in the Triple System with Avalon perennial ryegrass and Quantum tall fescue in the lower parts of the landscape. 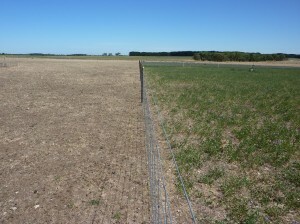 To consider the potential value of including lucerne in a perennial pasture system with traditionally winter rainfall dominance, we looked at the performance and contribution of lucerne at the Hamilton Site in the Triple System and of Fitzroy perennial ryegrass (which was part of the Perennial Rye System) as it was sown in the same land class as lucerne (i.e. on the crest). The Hamilton site ran Merino prime lamb and specialist prime lamb (as Coopworths) enterprises on both systems and these were run from June 2006/07 – 2008/09. Ewes lambed in September and were sold as store lambs at weaning. Steer backgrounding (March to January) and September calving cows were also run on these pasture systems. The contribution of lucerne in these years varied as shown in Figure 1. Over winter, both the lucerne and the ryegrass had average daily growth rates of over 30 kgDM/ha/day, except in 2008, which was also the one year that lucerne grew better than Fitzroy. The lucerne provided enough growth to run stock over summer in 2006/07 on the Triple system, whereas the perennial ryegrass system was destocked. In the following summer the relative growth rate was reversed. Figure 1. Average monthly growth rates for SARDI 7 lucerne in the Triple system and Fitzroy perennial ryegrass in the Perennial ryegrass system for winter, summer and spring at Hamilton EverGraze Proof Site. Feed quality of the lucerne and Fitzroy ryegrass at Hamilton also varied from year to year, but the relative differences in energy as Megajoules of Metabolisable energy (ME) and Crude Protein (CP) were consistent. The average results for energy and protein over the seasons are outlined in Table 2. The ryegrass was consistently one unit higher in energy in winter and summer and lower (in all seasons) in Crude Protein although the minimum levels were seldom below most stock requirements (i.e. 15%) remembering most young stock in the sheep systems were sold by the end of December. Cattle that had calves grazing over summer made the most response to the lucerne in the system, as these young animals were able to take advantage of the higher protein feed. Table 2. Energy and protein of lucerne and Fitzroy ryegrass at Hamilton Proof site. Overall the Perennial ryegrass system was assessed as more profitable (marginally) over the trial period due to higher livestock income, but stock were removed and required more supplementary feeding in 2006. The Triple System was more variable, due to the variability of summer rain and enterprise. The Ryegrass System was well suited to spring lamb store production and the Triple system may have more benefits (as tested in modelling) when young stock are carried through summer (as in the cattle systems). The value of including a summer active species like lucerne therefore depends on the climate and rainfall pattern as well as the livestock enterprise that is able to utilise summer feed without compromising on winter carrying capacity. It may be more profitable to run slightly less ewes (and so reduce winter feed capacity) if the system can grow lambs out to heavier weights. The value of lucerne will also improve if the future climate leads to more summer rain. Wagga Wagga Proof Site, in south west NSW, also has a cold winter environment and hot summer. Rainfall is less winter dominant than Hamilton and more uniform (40-60mm per month long term average) with a 650mm long term annual average. At Wagga Wagga, the Proof Site considered pasture systems with 20% and 40% lucerne in the whole system of perennial pastures (20% tall fescue and 40% phalaris) as well as sheep production systems (100% self-replacing Merinos or with 50% ewes joined to a terminal sire for first cross lamb production) and lambing times in winter (June/July) and spring (August/September). At this site there was no loss in profitability of having 40% compared to 20% of lucerne in the system. 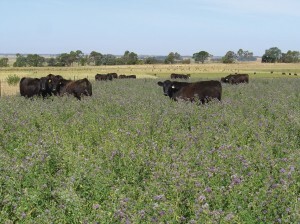 A combination of lucerne, chicory, phalaris and cocksfoot provides year-round stock feed at Kingston S.A.
Chicory is a herb with a high mineral content and when sown in a mix provides an alternative feed source. Some producers have used chicory successfully as a canopy in newly established lucerne. Chicory is a short lived perennial and therefore should not be expected to persist beyond three to four years. In a mix it also reduces chemical weed control options. For example broadleaf herbicides cannot be used, so pre-emergent weed control is important. Chicory has a tap root that can access moisture from two to three metres in the soil profile. Soil moisture data from EverGraze indicates it dries the soil to three metres, which is comparable to lucerne, but it has not been as persistent as lucerne. Summer rain is particularly important. If chicory can access subsoil moisture then it may be able to be grown in slightly drier conditions. It has been successful in many situations including sands in WA and clay loams in Victoria. Chicory provides herbage with high digestibility and high zinc, copper, manganese, magnesium, phosphorus, calcium and potassium levels, from October to April. It is usually more nutritious than grass pasture species. For EverGraze results on the production and persistence of chicory, see the Hamilton EverGraze Proof Site. Lucerne and chicory, whilst not considered ideal provided feed quality to finish lambs in W.A. Summer-active tall fescue grows very strongly in spring and summer (when moisture is available) and has reasonable autumn and winter growth provided conditions are not too cold and wet. Summer-active tall fescue is palatable and of high nutritive value provided it is kept short with frequent grazing in spring. It is very compatible with subterranean clover and allows a high legume content. Its tufted growth habit reduces pugging of the soil by stock in winter and so paddocks can be grazed when wet. It is tolerant of waterlogging for short periods. With some summer rainfall or where soils have a high water holding capacity, summer-active tall fescue can provide a high quality pasture over summer and will continue to grow at higher temperatures, when perennial ryegrass shuts down. The summer-active cultivars commonly used in NSW and the high rainfall areas of southern Victoria include Quantum and Advance. Kikuyu is a creeping, subtropical perennial grass that forms a dense turf, is tolerant of continuous heavy grazing and can be very persistent if placed in the right soils and with sufficient summer rainfall. Kikuyu is best suited to light soils. It grows rapidly in spring, summer and early autumn but is dormant in winter, at which time pasture production is driven by annual companion species such as subterranean clover. 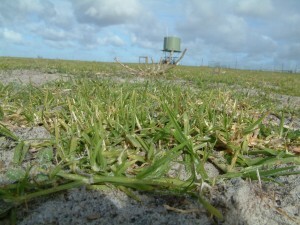 Kikuyu had low persistence at the Hamilton Proof Site, but has been a successful addition in Western Australia and on some of the sandy sites in South Australia. 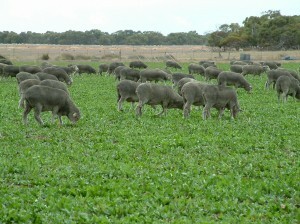 Kikuyu provides a low input option on sandy soils on Fleurieu Peninsula S.A.
Forage brassicas can provide feed for the post weaning period, when demands increase for high quality feed that is seed free and perennial or annual pastures are commonly losing their quality and growth rates are falling. It will also provide a clean paddock for grazing weaned lambs. 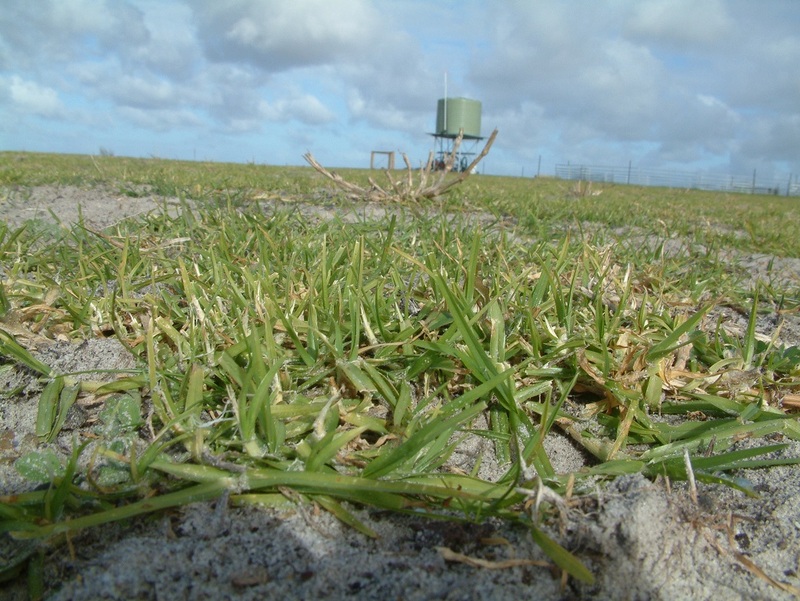 If paddocks are removed from rotation for pasture establishment, summer crops can be sown in spring following spraying or cultivation (or both) when the availability of pasture is not limiting animal production. This ensures that animal production on the remainder of the farm will not be reduced. Sown in October, the crop can maximize the use of soil moisture ensuring substantial growth before the dryer summer months. 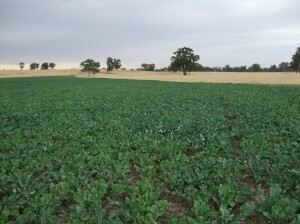 Brassicas have a relatively low cost of establishment and can produce large quantities (6-9 tonnes DM/ha depending on the season) of high quality feed in late spring, summer and autumn when perennial and particularly annual pastures are declining in quality and quantity. Lamb growth rates recorded range from 60-316g/hd/day (Judson 2010) and cattle from 0.7-1.2kg/hd/day (Chin et al 1993) depending on the stocking rate (allowance per head) and the season. Forage brassicas can be an excellent part of a pasture improvement program. By working and leveling the paddock in the spring and using the forage crop to reduce the seedset of broadleaf and grass weeds, it reduces preparation time for autumn sown pasture. In many cases the autumn sown pasture can be direct drilled. The other advantage will be the extra fertility of the paddock coming out of the summer crop due to the fertilizer application during sowing. A forage crop can break clover pest and disease lifecycles (Nematodes/viruses) for better clover content in subsequent pastures. Brassicas are annuals so a pasture or crop must be sown after they are consumed and there is a risk with a dry spring/summer that their yield will be significantly less. Table 3 summarizes some of the considerations as potential issues, costs and benefits for including lucerne or annual forage crops compared to supplementary feeding with grain. Need to resow after 4-10 years (dependent on location, management and lucerne variety). Infrastructure (silo, feed out cart, auger). More bare ground, if planted as a pure stand. Can purchase in advance (price) and store if facilities available.